The history of Mays Ranching Company began with the birth of William Henry Gibbons on October 4, 1846 in Ireland. He was born to a successful merchant family, but the potato famine forced uncertainty for well being. It is not certain when, but between 13 and 16 years of age he decided to leave home to assure more financial security for his family. William Henry Gibbons, also known as Uncle Billy Gibbons, sailed to America as a stowaway on a merchant ship, which ported at Boston. When he reached America, Billy Gibbons had no money. Searching for work he met up with followers of Brigham Young who were on their way to Utah to build the Mormon Church. The Mormons provided much needed food and shelter. Billy worked there for a while building up some savings. Slightly better off he headed back east with a meager amount of money. Along the way Billy met his brother who too left Ireland to come to America. Following a brief visit, the two went their separate ways never to see each other again. Throughout Billy’s stint in America he dreamed of moving to Texas and becoming a rancher. His mother’s family was successful sheepherders in Ireland. Various jobs kept Billy afloat and kept his dream alive. In pursuit of his very own ranch, Billy ended up in San Antonio in the early to mid 1860’s. While in San Antonio he found a job operating an elevator at the Menger Hotel for small wages. To conserve money, he slept in the elevator and ate scraps from the hotel kitchen. When he got a few dollars ahead, Billy went back to the northeast to try to secure financing for his dream. In the early 1870’s, Billy found himself in New York. According to family tale, he found a Jewish banker who was willing to take the chance. The banker, obviously a gambler, made young Gibbons an unsecured loan to get started. Anxious and relieved Billy headed back south to Texas. Billy eventually made his way to Galveston and then into Mexico where he purchased 1,000 head of Moreno sheep. He then loaded them on barges and brought them up the eastern coast of Mexico to Galveston where they were off loaded and herded north. On foot William Gibbons followed the 1,000 head north. Finally in the spring of 1876 on a Sunday morning, the sheep put their heads down and began grazing along Brady Creek in present day San Saba County. Billy had found his ranch. He felt that the land was well suited for sheep and claimed it his own. Billy was a fiery red-blooded Irishman who stood well short of five feet tall. He was one of the first to introduce sheep into this part of Texas. This did not sit well with the dominant cattleman of the area. On two separate occasions, he was strung up to be hung by cattlemen. Using his God given bargaining abilities, he talked his way out of the hangings. Early in his young career, Billy Gibbons found himself in financial troubles. At this point he had not purchased any land and was still operating on open range. His loan had matured, yet he could not make payment. By the late 1870’s William Henry Gibbons had found himself broke and back in New York to return what little money he had left. He was more than prepared to call it quits and return to Ireland. The banker had no use for sheep or land in Texas and sent Billy back to Texas with more financial help. The additional loan didn’t prove to save Gibbons from his financial dilemma. Adverse weather, predators, and Indians had pushed him to the limit. Within two years, Billy found himself back in his banker’s office and determined to go back to Ireland. Billy, extremely frustrated, threw his inventories and financial statements on the banker’s desk and stormed out of his office headed to the harbor to buy a ticket on the next ship leaving for Ireland. The persistent banker followed young William Henry to the ticket booth and convinced him to try one more time with another loan. This time Uncle Billy made it. Settlers had begun moving into San Saba and surrounding counties. The Indians in the Hill Country were fighting a losing battle for their lives and beloved homeland. Without the threat of Indians, making a living became a little easier. By 1883, Billy Gibbons began buying land. The most he ever paid was fifty cents per acre, and he bought some at one cent. Eventually, Billy began raising cattle along with his sheep and would routinely drive cattle to Fort Worth. On one occasion, after Billy had built considerable wealth, he found himself getting into Fort Worth late in the evening after driving cattle for days. Billy needed a bath badly and began searching for a place to clean up. He stepped into what is believed to have been the Blackstone Hotel and requested a room. The night clerk was absolutely disgusted by his appearance and refused him service. The clerk’s actions infuriated Uncle Billy. So, that night he set out in search of the owner of the Blackstone. Billy found the owner, bought the hotel, and fired the night clerk all in the same night. Also along the way, Billy married Mary Virginia Taylor in 1880. The two of them had six sets of twins, but only one set survived (Mary and John William Gibbons). One single birth also survived (Ed Gibbons). Uncle Billy and Aunt Molly, as they were called, accumulated some 50,000 acres of prime ranch land, stock in the Commercial National Bank of Brady, saloons in three Texas towns, hotels in two Texas towns (Fort Worth and El Paso), a farm at Post, farm property at Muleshoe, and they owned the Peoples State Bank in Richland Springs. He financed many agriculture operations of the area and W.H. Gibbons High School at Richland Springs was named in his honor. At his death on March 18, 1932 his net worth was some $2,000,000. His name lives on today through the Billy Gibbons Boy Scout Camp located on the ranch. Following the death of Billy Gibbons, his ranch property was divided between his two sons, Ed and John, who ranched independently. The Billy Gibbons Ranch was operated by heirs with the Gibbons sir name until 1950 when John Gibbons died. Ed preceded him in death. Following his death, John’s ranch property was divided between his two daughters, Virginia and Elizabeth. Elizabeth Gibbons Mays was born and reared on the ranch, spent her entire adult life on the ranch, died on the ranch, and she is buried on the ranch. This transpired over seventy years, all within a radius of one mile of her birthplace. Due to marriages and other circumstances of fate, various other heirs have moved away from the daily, hands-on experience with the ranching business. Mays descendants have actively continued uninterrupted ownership and operation of a part of the original Billy Gibbons Ranch since the death of the last Billy Gibbons child. The Texas Department of Agriculture has awarded Mays Ranching Company the Family Land Heritage Certificate of Honor in recognition of more than a century of continuous ownership and operation as a family agricultural enterprise. The basic wealth of Texas is indebted to Her founders for their dedication and perseverance. In 1971, Mays family members began leasing the Virginia Gibbons Miller portion of the original Gibbons Ranch. 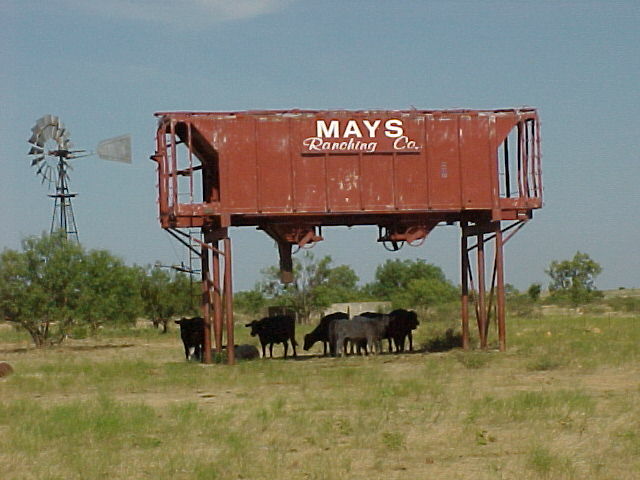 In 1979 Mays Ranching Company, a Texas corporation, was founded by uniting the lease operation and the deeded operation--all of the shareholders are direct descendants of Billy and Mary Gibbons. Myron Mays, a great grandson of Uncle Billy and Aunt Molly manages Mays Ranching Company; thus, Mays Ranching Company is proud to be actively involved in the successful operation of the original Billy Gibbons Ranch.